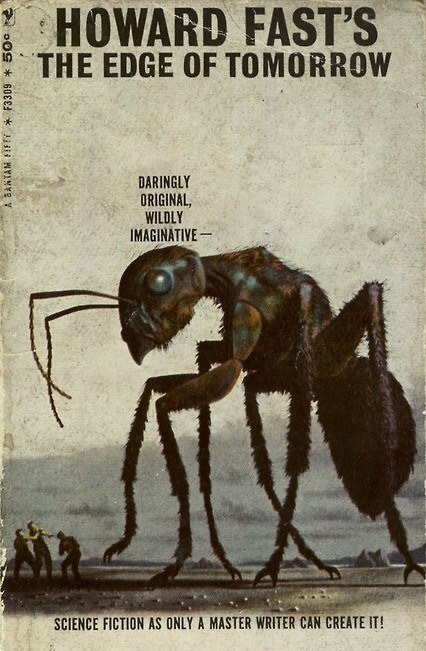 Giant Art | Kill All Monsters! Three things as I continue catching up with some old news, starting with this awesome pin-up by my good friend Gavin Spence. I love how he even worked in the zipatone effect. Thanks, Gav! 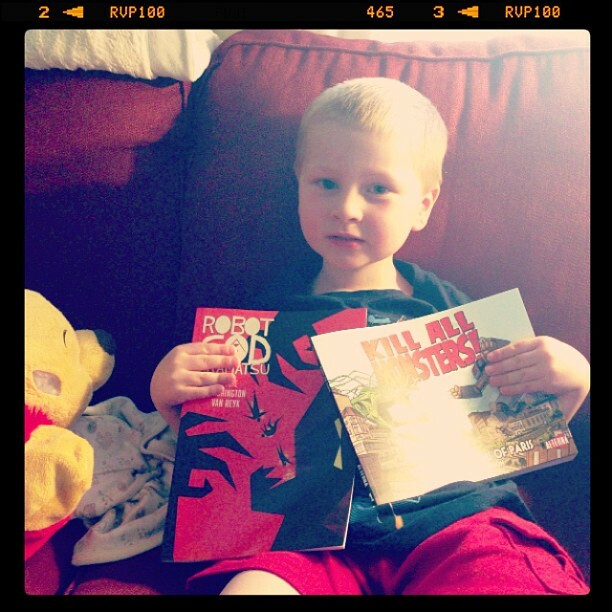 Then there’s this picture that Robot God Akamatsu‘s writer James Biggie posted with evidence of his son’s very discerning taste in literature. 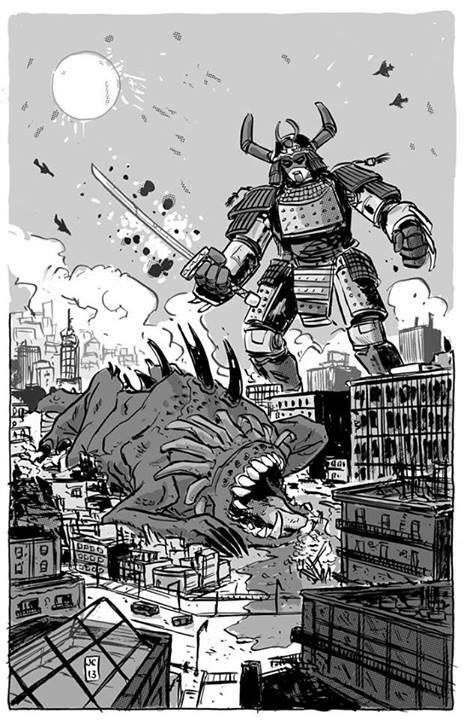 And finally, my friend JK Parkin very nicely talked about Kill All Monsters in Robot 6′s Report Card column after the graphic novel hit stores last year. I’ve known JK a long time and we have really similar tastes in comics, so it makes me especially happy that he digs KAM. 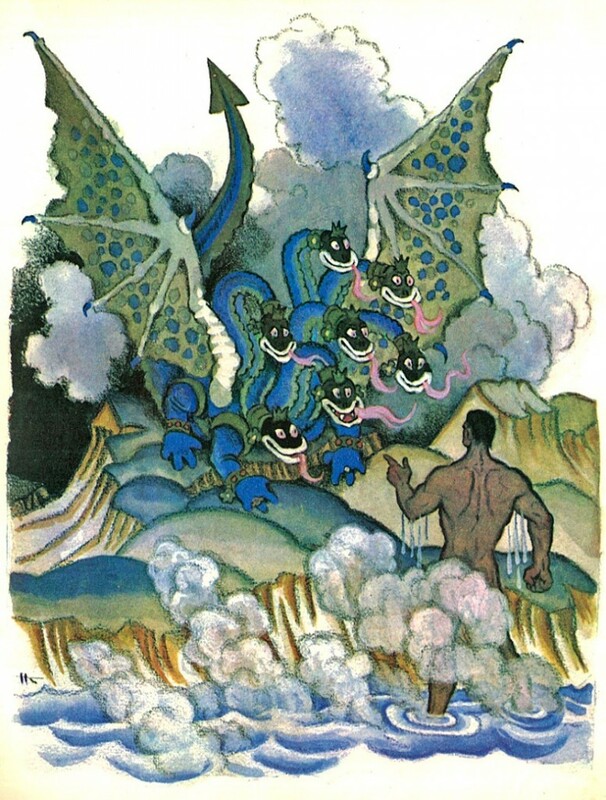 He writes, “May and Copland have engaged in some pretty cool world-building, taking the basic idea and running with it until they have something special that goes way beyond what you might expect from ‘another giant monster title.’” Thanks so much, JK! 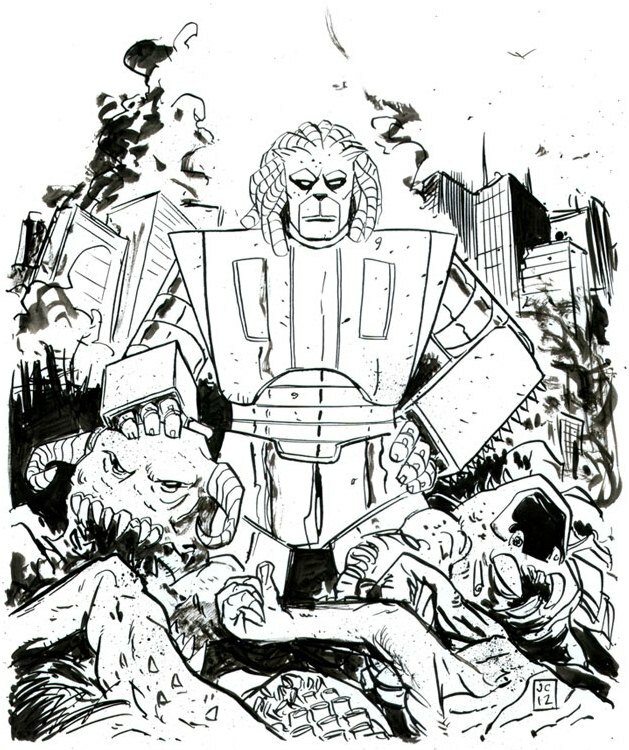 This entry was posted in Giant Art, Reviews and tagged Gav Spence, James Biggie, Robot 6, Robot God Akamatsu on May 8, 2014 by Michael May. 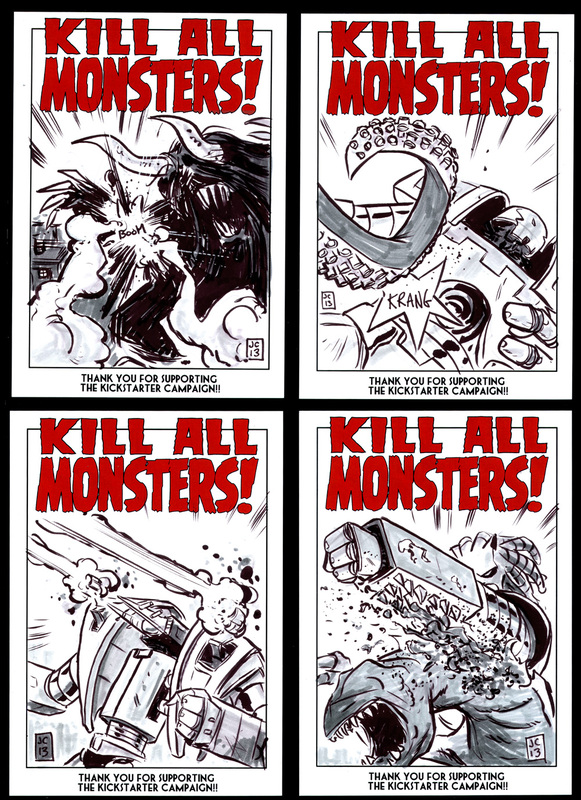 Got a fragrant potpourri of Kill All Monsters updates for you this morning, starting with a look at some of the cards Jason made last year for the Kickstarter levels that include sketches. Rather than just sketch in the books, Jason went all out and had special cards printed so that he could do something a little nicer. 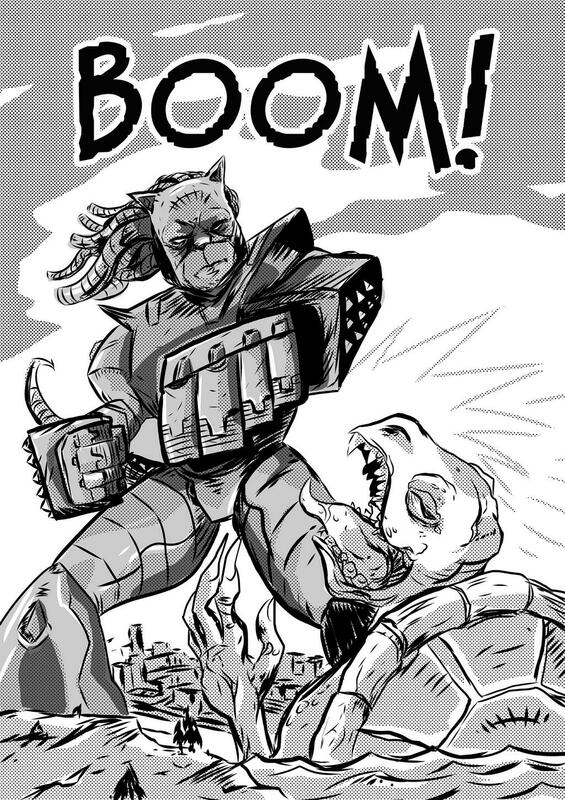 Speaking of Kickstarter, we’ve talked about doing another Kill All Monsters comic a little sooner than expected. Before we release Volume 2, we’d like to put together a one-shot single issue (around 30+ story pages) that expands on the world a little while also tying into the story we’re telling in the graphic novels. We thought about doing it as a Kickstarter project, but we’re not sure that’s the best way to get a single-issue comic printed. It’s all written though and we want to do it, so it’s just a matter of figuring out the best way to go about it. 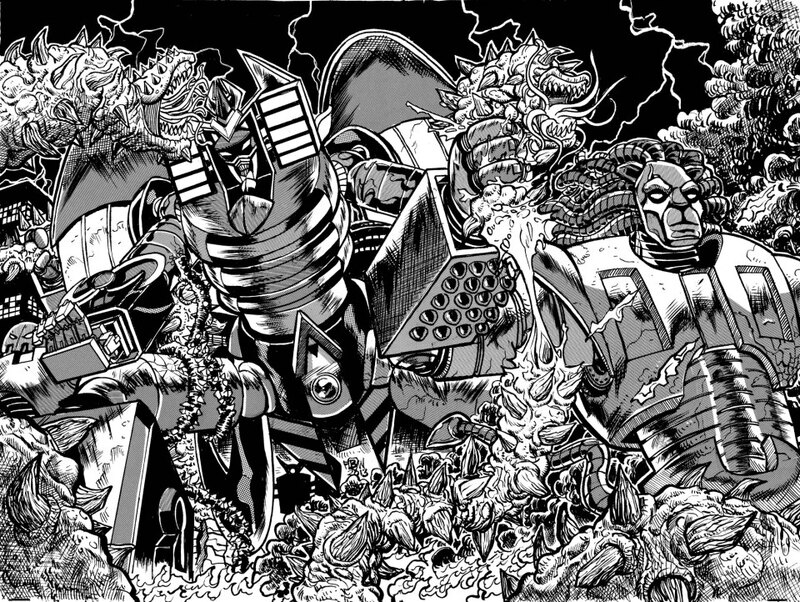 That’s a piece that Jason drew for the Monstrosity anthology and it’s not the only giant robot pinup he’s done lately. 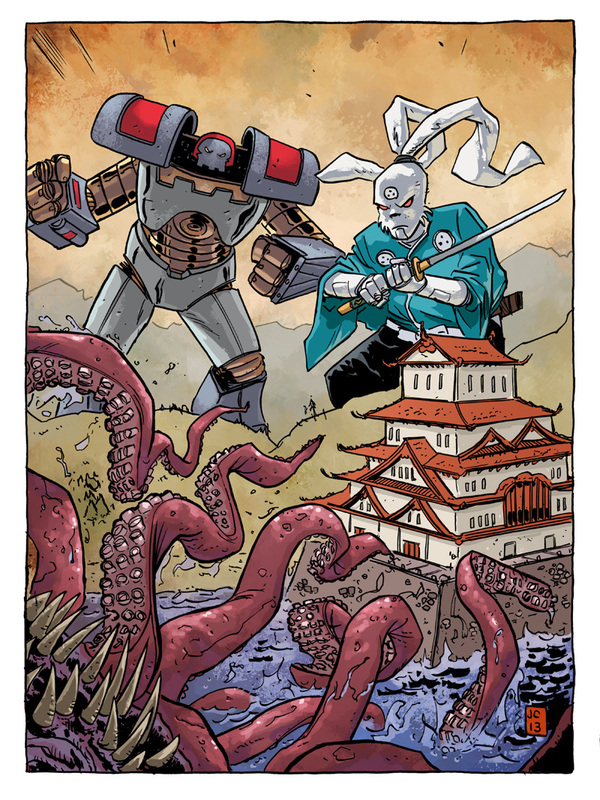 He also did this one for last year’s Baltimore Comic-Con yearbook, which had a Usagi Yojimbo theme. Mike Spicer did the colors and it looks great. Finally, Jeff Bouchard from Comic Spectrum wrote a very nice review of Kill All Monsters giving it 4 out of 5 stars. He said that he got a Kamandi feel from it (very cool) and wrote that it “provides a visceral experience from the over-the-top battles between monster and mech at the same time weaving deeper plot points that leave you thinking and wondering where the story will go.” Thanks, Jeff! This entry was posted in Giant Art, KAM! 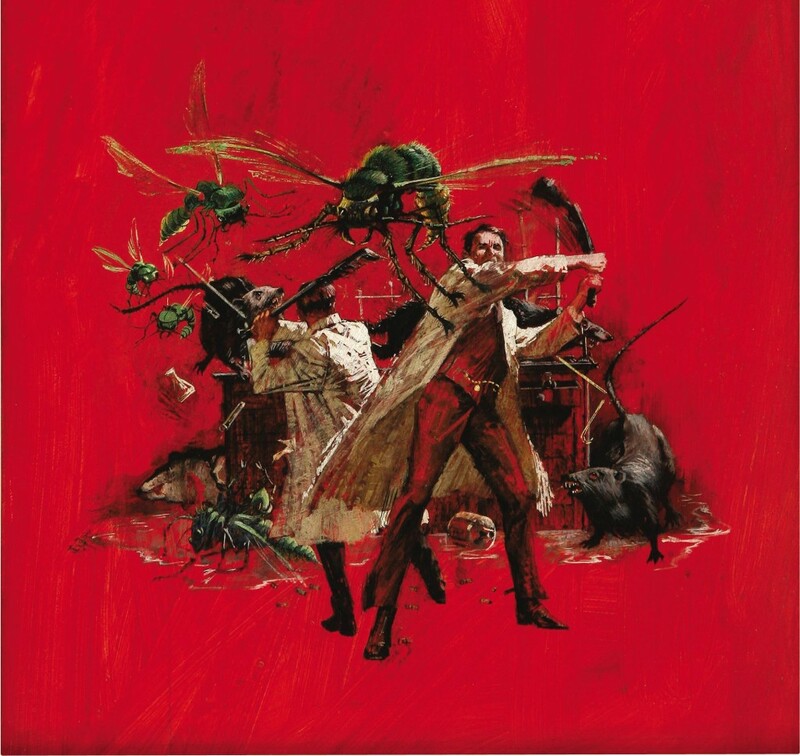 News, Reviews on May 7, 2014 by Michael May. 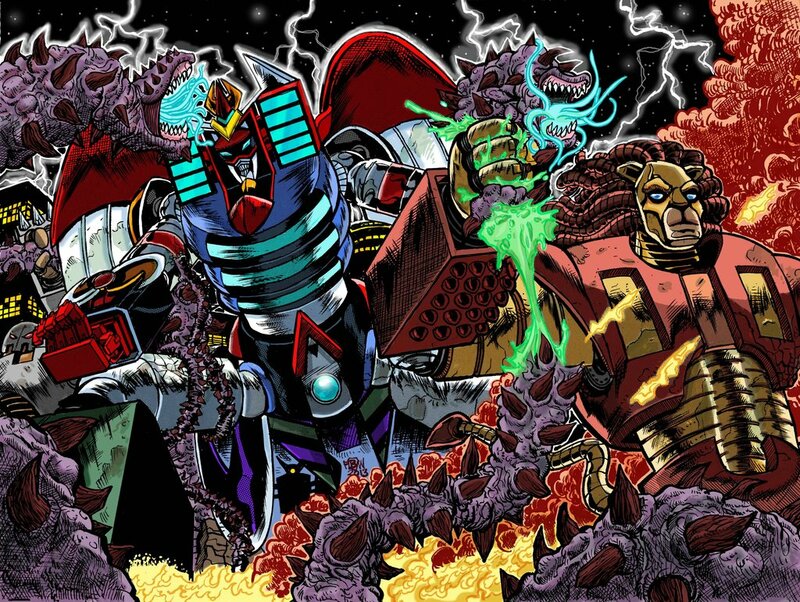 Frankie B. Washington (Robot God Akamatsu) went and colored that RGA/KAM piece he did a while back. It’s gorgeous and available as a print from Frankie’s DeviantArt page. Also on DeviantArt is this great piece by Daniel Mead. 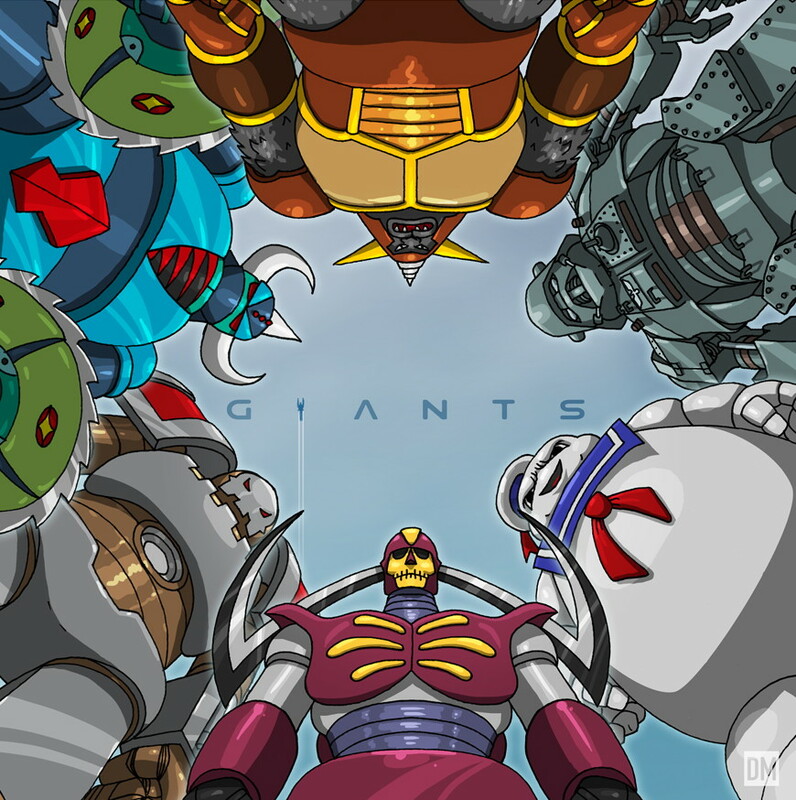 I didn’t realize how excited I would be to see Dressen’s SkullBot standing next to classic giants from Mazinger Z and Ghostbusters. It’s the tenth in a series of giant-related pieces, so check out Mead’s gallery for the rest. 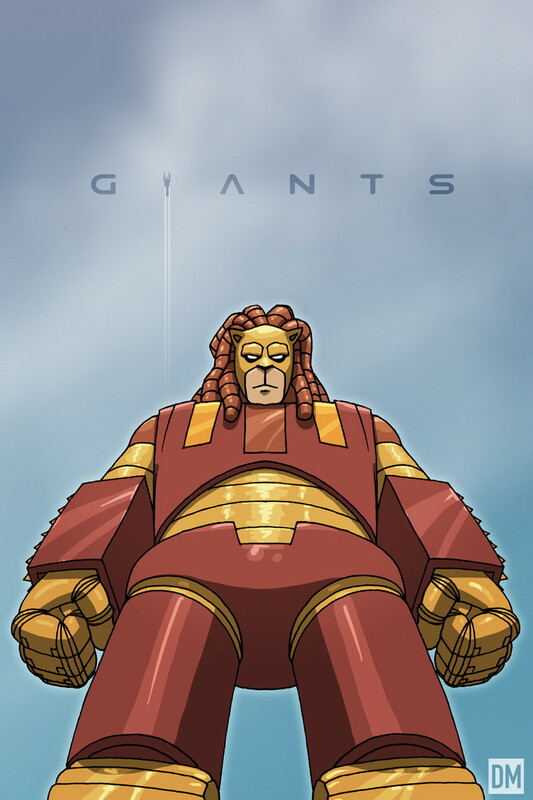 …and one of Spencer’s LionBot too. Really cool work by both of these guys! 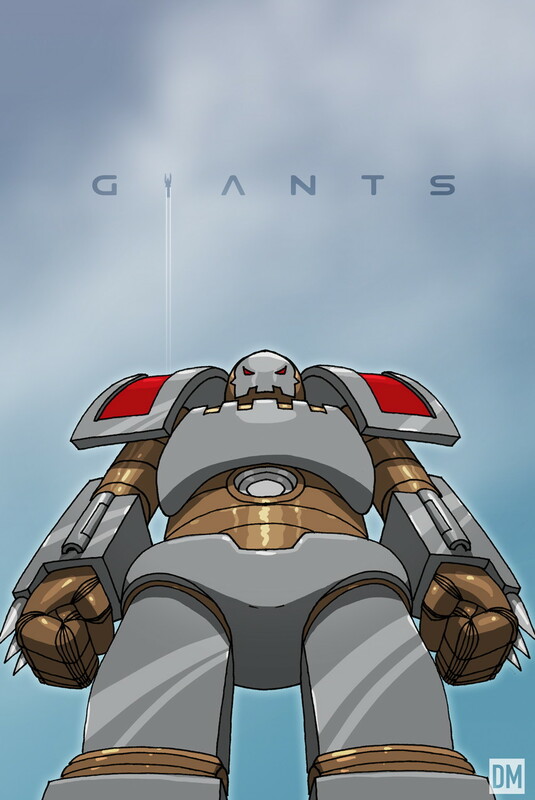 This entry was posted in Giant Art and tagged Daniel Mead, Frankie B. Washington, Mazinger G, Robot God Akamatsu, Stay Puft Marshmallow Man on July 3, 2013 by Michael May. Jason is at Emerald City Comicon this weekend and he has Kill All Monsters! ashcans and prints (color and extremely limited edition black-and-white) with him. You can find him and KAM letterer (and awesome writer of his own stuff) Ed Brisson at table F-10 in Artist Alley. As long as we’re on the subject: if you haven’t Liked the KAM Facebook page yet, you totally should. Whenever we hit a Likes milestone, Jason draws a random name and then draws a KAM picture for that person. The one above is the most recent. It’s been a long time since we’ve updated you on the comic, so let’s do that, too. I’m currently writing the last chapter, but we’re already deep into plans for the return of KAM. I can’t say much yet about what that’ll be like, but I will say that there will be another print version before we relaunch the digital version. Not another ashcan, but that’s all I’ll say about it for now. We’re way excited. This entry was posted in Giant Art, KAM! News and tagged comic update, conventions on March 30, 2012 by Michael May.